At the conference of the Affiliated Tribes of the Northwest Indians (ATNI) on February 19, 2014, Katie Johnson and Helen Spencer presented tribal leaders with information about how children's undetected vision issues directly impact their success in school and in life. "Thinking that children who can see clearly at twenty feet away can read print clearly at 10 inches away is like saying that oranges will grow on apple trees." Tribal elders know that native children do not need more problems than they may already have -- poverty, lack of support, discrimination. Vision and speech problems of young children can be detected and changed. On Wednesday, February 19, a panel of five spoke on concerns about Indian children's health issues. Led by moderator Gary Peterson, two women spoke about speech problems among native children and what is being done to help them, and two spoke about vision problems that affect native children throughout the region. Katie Johnson, author of Red Flags for Primary Teachers, and Helen Spencer, advisor to Americorps in Washington's Yakima Valley, spoke to the assembled tribal leaders about the great numbers of children who go through school unable to see clearly enough to read. Spencer and Johnson are actively working to include screenings for near-vision (at reading distance) in Washington schools. The children in all the ATNI states are currently screened for distance vision, using the Snellen Chart (see photo). This chart of letters hangs in every school nurse's office and children are asked to read the letters from twenty feet away. Passing that screening, however, does not mean that reading letters in a book will be easy. Almost 25% of all American children do not have the binocular (near) vision skills they need to learn to read well. Speaking movingly about the lack of support for Indian children's speech issues, Billie Higheagle of the Puyallup tribe near Chehalis, WA, a public school speech pathologist, and Haila Old Pete, a Skokomish speech pathologist in the Thurston WA public schools, gave many examples of the bleak picture for children with speech issues in their work places. The Winter Convention of the Affiliated Tribes of Northwest Indians, held at the Lummi Nation's Silver Reef Casino in Ferndale, WA, was a four-day event in February, with more than thirty-four tribes represented. 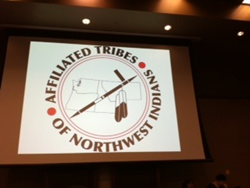 The ATNI member tribes come from Washington, Oregon, Idaho, and Montana. Katie Johnson and Helen Spencer will present more information about children's vision issues at the ATNI spring conference in May of 2014.